The Modern Foreign Languages Department are very proud of all their A-level French, Spanish, and German students who are giving back so much to their department through the administration and running of exciting new projects in addition to the long-standing French and Spanish Societies. The German A-level group continues to grow in numbers as a direct result of students' positivity, enthusiasm, and passion for languages. The mentoring programme pairs up students studying A-level and GCSE Languages with those in younger years to act as a ‘buddy’ and to help them improve their language skills. One pair that is off to a flying start and is a real cause for celebration is Katie & Emily. 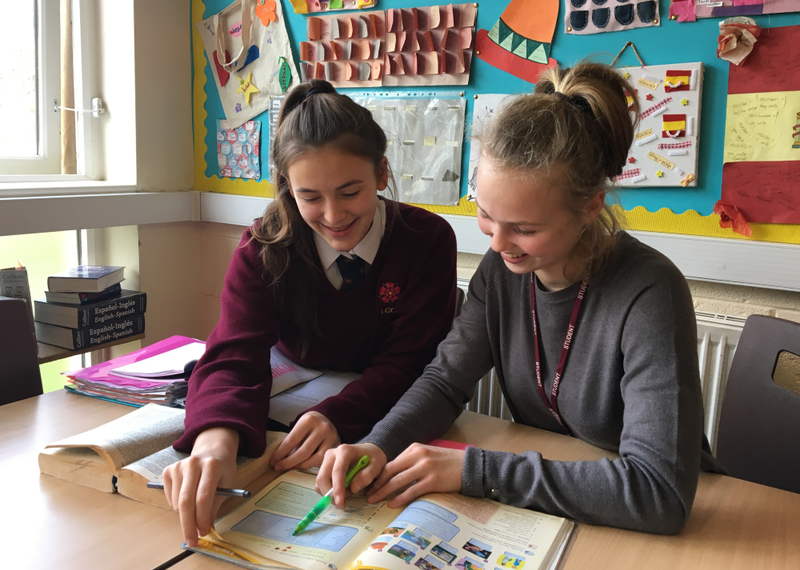 Emily joined LGGS at the start of Year 10 and has taken up GCSE French under Katie’s guidance and support. Many of our Year 12 students are thinking of studying languages at university and have chosen to contribute to lower-school lessons. As such, Year 12 Language students are gaining valuable experience of using their languages in a teaching role. The students in lower-school are very appreciative, as having older girls to support and guide them through their work is an incredible opportunity. Year 10 GCSE Spanish students have been improving their written Spanish with the help of our A-Level students. They are thoroughly enjoying writing old-fashioned pen pal letters to one of our partner schools in Castellón, which is not far from where we travel to on the Spanish Exchange. We are very much looking forward to the opportunities that may open out to them through this exciting project. Another exciting project that our Year 12 A-level students are in the process of setting up is a Spanish Conversation Club. This will be open to all students after half-term and will take place each Tuesday lunchtime.